In the event that a MindWare analysis application erroneously marks noise in a signal as an R peak, you must delete that R peak marker to accurately calculate statistics based on the R peak series such as Heart Rate, RSA, and Stroke Volume. 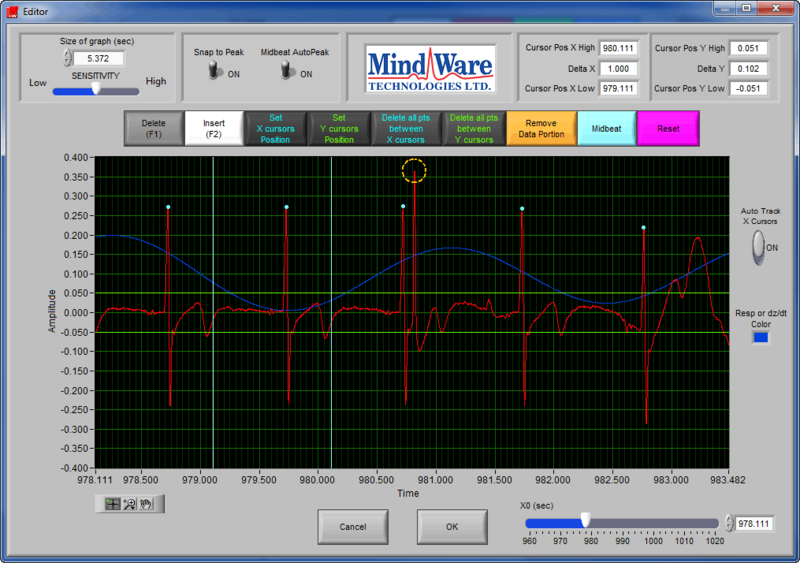 This article shows how R peaks can be deleted using the Delete tool in the ECG Editor. Once the editor has launched, locate the section of the signal where you would like to delete a peak. It can be helpful to zoom into that section to see it more clearly. By clicking the red Delete button (or pressing F1 on the keyboard), your cursor will change to an orange circle. This circle represents the region of the graph in which you want to delete an R peak. Using the scroll wheel on the mouse will expand or contract this orange circle, allowing you to delete R peaks with more precision when necessary. When no scroll wheel is available, directly adjust the Sensitivity slider in the upper left-hand corner of the editor window. With the Delete tool enabled, move your cursor so that the R peak marker you want to delete falls within the orange circle. Be careful not to include R peaks you want to keep in the circle! Click the left mouse button to delete the selected R Peak(s). Note that the Delete tool will remain active until purposely deselected, or a different tool is selected. Be aware of this so you do not accidentally delete more peaks. Multiple R Peaks can be deleted by expanding the orange circle to encompass multiple markers, or by using the X and Y cursors. Press OK to save the changes in the editor and return to the analysis screen. By clicking the red Delete button (or pressing D on the keyboard), your cursor will change to a red circle. This circle represents the region of the graph in which you want to delete an R peak. Using the scroll wheel on the mouse will expand or contract this red circle, allowing you to delete R peaks with more precision when necessary. When no scroll wheel is available, directly adjust the Sensitivity slider in the Point Editing section of the toolbar. 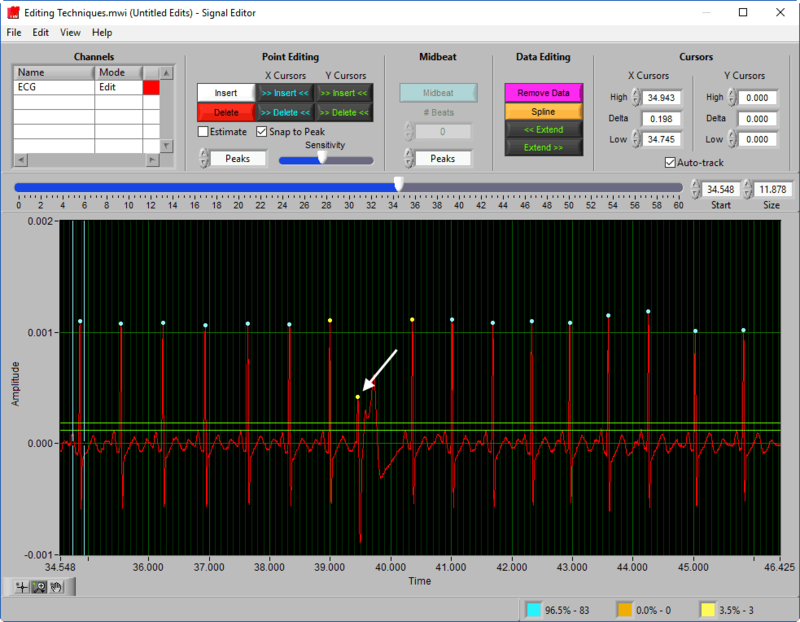 With the Delete tool enabled, move your cursor so that the R peak marker you want to delete falls within the red circle. Be careful not to include R peaks you want to keep in the circle! Click the left mouse button to delete the selected R Peak(s). 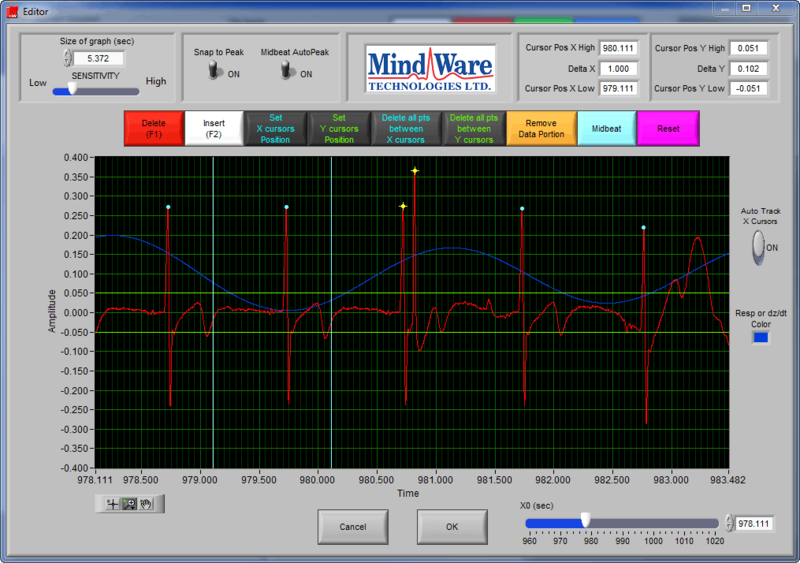 Note: In this particular example, editing would not be complete until the timing is restored using the Midbeat tool when editing for HRV.